One of the most feared bootlegging mobs during Prohibition, the Detroit Purple Gang was basically an all-Jewish outfit. 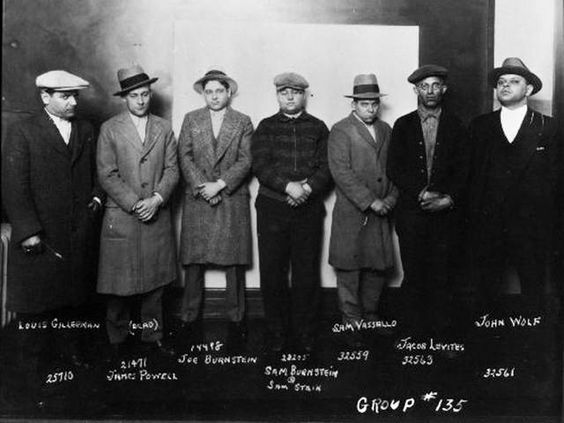 The gang dominated the city's criminal activities and was responsible for at least 500 killings—a record that, proportionally speaking, exceeded the tally of the Capone mob in Chicago. Its leaders, Benny and Joe Bernstein and Harry and Louis Fleisher, maintained close ties to the Cleveland Syndicate and such stalwarts as Moe Dalitz and Chuck Polizzi. Detroit was a pivotal importance during Prohibition because it served as a funnel for illegal booze shipped across the border from Canada. The Purples engaged in competition with another mob, the Little Jewish Navy, and to aid them in their killings, they imported Yonnie Licavoli and his gunners from St. Louis. Licavoli and his brothers, cousins and friends in time formed what would be called the Licavoli family of the Mafia in Detroit. Licavoli did not ever challenge the authority of the Purples, whose other gunmen were considered so proficient that, according to a leading theory, three of them—George Lewis and brothers Phil and Harry Keywell—were borrowed by Al Capone to help carry out the St. Valentine's Day Massacre in 1929. The Purples did not limit themselves to booze running, but accumulated additional millions in jewelry robberies, hijacking and extortion. They were also involved in drugs and were one of the prime suppliers to jazz musicians of the 1920s. When the national crime syndicate was formed in the 1930s under the aegis of Lucky Luciano and Meyer Lansky, the Purples were invited to join. No coercion was used—the gang was considered too bloody and powerful to be subjected to force. However, the Purples accepted, disbanded their own organization and took an important role in the crime cartel's far-flung gambling activities, often providing any "muscle" that was needed. The name of the Purple Gang was too colorful to be allowed to die, and years later any really tough character from Detroit was quickly labeled by the press as being a member of the Purple Gang.